Whether you have a general aversion to avocados or just an aversion to their cost — the price of avocados increased 125 percent in 2017 — you have plenty of healthy ingredient substitutions that not only save you money but diversify the taste and texture of a variety of dishes, guacamole included. Don’t let an avocado shortage slow down your guac game. For each avocado used in your guacamole recipe, substitute one cup of steamed, blended spring peas, organic edamame or chopped asparagus. Check out our recipe for Sweet Pea Guacamole below. Avocados give sauces and soups a unique, creamy texture few ingredients can replicate. But that doesn’t mean you can’t get the same consistency without avocados–you just need to apply a little creativity. Create the satisfying freshness of your favorite avocado dressing using Greek yogurt, cilantro, and an optional tablespoon or two of sour cream. For every avocado called for in the dressing recipe, substitute ½ cup Greek yogurt and 1 cup of loosely packed cilantro leaves (minced or processed in). Hummus makes a great substitute for avocado dip on its own, but you can add an avocado-esque touch with a few extra ingredients. To every ½ cup of chickpea hummus, add ½ cup steamed organic edamame, ¼ cup loosely packed parsley leaves, ¼ cup basil or cilantro, 1 teaspoon of lime juice and 1 teaspoon of coconut oil. Avocado toast went from fad to foodie staple almost overnight. Take the concept a step further with a clever, spreadable substitution, such as a chunky cashew spread. Soak cashews for a few hours and blend until coarse with a little water or stock and your secondary ingredients of choice, such as pesto, steamed squash, nutritional yeast, fresh herbs or chipotle peppers. With their lush consistency and laid-back taste, avocados complement just about any salad. No avocados, no fear! Try sliced peaches (briefly steamed), seared artichoke hearts or farmers cheese (for creaminess) in your next salad for an exciting new texture. Southwestern-style cuisine and avocados go hand-in-hand–they contrast the spiciness and hearty textures of tacos, salsa, corn salads and other rustic dishes beautifully. Next time you need avos in tacos or other Southwestern dishes but come up short, try roasted sweet potatoes, roasted chayote squash, queso fresco, roasted cauliflower or oven-fried plantains instead. Add all the ingredients to a food processor and process until nearly smooth. Adjust the consistency and seasoning as needed with olive oil and kosher salt. Food manufacturers are always looking for new ways to keep consumers engaged with their brands. They’re also looking for new ways to encourage you to eat, or a new flavor to tempt you with. After all, the more you eat, the more profitable their product is. Unfortunately this has turned us into a nation of snackers. We’ve been so effectively marketed to that we think we have to have snacks. Even more than that, when we say the word snack most people think chips, pretzels, granola bars, or other high carbohydrate foods which deliver a lot of calories and little to no actual nutrition. Unfortunately the more we snack the less hungry we are when meal time comes around. So perhaps we don’t eat a real meal. And then a couple of hours later we’re hungry again and it’s time for another snack. By the time you get to the end of the day it’s possible that you’ve simply snacked for the entire day. You go to bed, wake up, and do it all over again. The challenge is that you’re just making yourself hungrier and hungrier. Your belly may be full, but your body is not nourished. Snacking is not meant to replace mealtime. It’s a mini-meal. A little something to keep you going if you’re hungry in between regular, nourishing meals. Preferably something that has a little protein and a healthy fat. Healthy snacking can help to keep your blood sugar stable. All day snacking, especially with high carbohydrate snack foods can put you in the front row seat of the blood sugar rollercoaster. As part of their effort to keep you snack-engaged, food manufacturers sometimes run campaigns designed to get consumer feedback on flavors. One example is the Pepsi Co. “Do Us A Flavor” campaign which they’ve been running since 2012. [I’m deliberately not linking to it because I don’t want to participate in bringing attention to it — you’ll see why in just a minute] Thanks to this campaign they’ve come up with different, unusual flavors of potato chips such as Korean Barbeque or Smoked Gouda and Chives. Some manufacturers are looking to build brand excitement by “retiring” flavors or creating “limited editions” in an effort to create a scarcity effect. By creating these campaigns the manufacturers are hoping to build further brand engagement. To hook you a little bit more closely to the brand. They don’t need to guess at developing new products. Consumers tell them exactly what they want so the manufacturer can make it. It allows them to save money and tempt you to eat more snacks. All of these flavors, however, don’t add up to good nutrition. They simply add up to more chemicals and more calories. If you’re looking for a healthy snack check out this article on protein snacks to boost energy. Want to know more about flavors and how they’re used in food? are natural flavors really natural? When you’re looking for a snack, remember, a snack is not a meal. Choose a little something with some protein in it and have just enough to get through your day to your next meal. You’ll feel better and your metabolism will be more balanced because of it. Snacks are a part of almost everyone’s day, from children to adults. Supermarkets and convenience stores offer a wide array of snack choices from candies and snack-size cakes to peanuts and chips. However, some snacks leave a person feeling energized while others can leave you feeling tired, lethargic and possibly even moody. The reason for this is found in the contents of the snack. The best snacks are those with a higher profile of proteins instead of sugars. Snacks filled with protein give fabulous energy boosts. A protein is a substance formed by a conglomeration of bonded amino acids. The proteins, and by extension the amino acids, found in foods are the building blocks of the body’s cells, vital for maintaining all the cells in the body and providing the energy the body needs to function. How does protein boost energy? Proteins are a far different energy source than carbohydrates. When a person eats carbohydrates they are broken into sugars, which provide quick energy. However, this energy only lasts a short time, eventually leaving the person feeling tired. Proteins provide a much longer source of energy than carbohydrates do. The energy from proteins is a more consistent fuel that powers the body. In addition, adequate protein in the diet guards against fatigue, disease and moodiness. If you want to know your body’s protein requirements, Georgetown University provides a helpful table for determining how many grams of protein men and women need each day. When choosing protein for snacks it’s important to understand that there are two main types of protein; complete and incomplete. A protein is considered to be complete if it contains all of the essential amino acids necessary for body growth and function. In general, animal products contain complete proteins while plant-based products are incomplete. However, consuming a variety of plant-based products can still give a person all the amino acids they need by combining to form a complete protein. As an example, combining grains and legumes will form a complete protein. Of course, protein should be consumed in moderation. While protein is vital for all individuals and moderate amounts of protein make excellent snacks, consumption of excessive amounts may eventually begin harming the kidneys. Protein is a good choice for busy days when adequate stamina is vital. Iliana Spector is a health writer for Assisted Living Today, a leading source of information on a range of topics related to elderly care and assisted living. I recently got asked the question, “How do I eat more fruit and veggies, I don’t think I’m eating enough?” That’s a good question. And one that’s faced by a lot of people. Especially parents who are trying to encourage their children to eat a healthier diet. One of the best ways I have found to encourage people to eat more fruits and vegetables is to have them on hand and convenient. This means they are not in your fridge just rotting in the bottom of your crisper drawer. I frequently encourage people to cut them up, prepare and make containers. Set them out on the shelf in your fridge and it’s a grab-and-go snack. They can either be sorted by type of food or you can make “snack packs” with an assortment. Either way if you’re in the mood to munch and you open the fridge door to see a convient snack right there you may find yourself eating more healthy choices. Another way is to add veggies to other foods. You would not believe what gets added to my homemade spaghetti sauce. Add shredded veggies to a lasagna. Double the veggies in your omelette or frittata. What about soups? Loaded with pureed veggies, especially if it’s a creamy style soup base is an easy way to boost your veggie intake without trying very hard. The trick is to make sure that you put in things that will not overwhelm your soup. Sharper tasting foods such as cruciferous vegetables (cabbage, cauliflower, broccoli, etc) or onions may not appeal to some. Mucilaginous textured foods such as okra may not appeal to others. Experiment and be mindful of what you are adding in. Choose seasonal fruits and vegetables. I can’t stress this enough. A tomato in season and from a farmer’s market (if possible) tastes like the most delicious, amazing thing. A tomato in the middle of winter with a waxy coating tastes like cardboard. When foods are in season, and hopefully local, they are picked close to ripeness. Otherwise they may be picked early, stored, and then force ripened with ethylene gas. This forced ripening does not allow the flavor to come through, it just makes it look ripe. If you’re eating unappealing, non-tasty fruits and vegetables it does not encourage you to want to eat more. As a side benefit, you really appreciate things when you can only have them in season. Make different choices when you eat out. There are tasty ways to add more veggies to your diet when you are eating out which allow you to still enjoy your dining experience but avoid getting bogged down by the simple carbs and other unhealthy choices. Skip the juice and eat the fruit. Did you know that it takes an average of 4 oranges to make 8 ounces of orange juice? That’s a lot of sugar and those extra calories add up pretty quickly. It would be pretty difficult to eat four oranges in one sitting. However each orange you eat comes with a significant amount of fiber which helps to slow down the glycemic effect. The same is true for other juices. Switch your juice to water (add a few slices of fruit for flavor if you like) and eat the fruit instead. Keep a food journal. An 8.5 x 11 sheet of paper folded into quarters gives you 8 spots to write down what you eat each day. If you’re looking to increase things like water consumption (always a good idea) and fruits and veggies set a goal for yourself and then keep track of it. By looking back over the week you’ll be able to see if you’re meeting your goal and where you can make changes to increase your consumption a little at a time. Small changes add up over time. By making one or two adjustments you may soon find yourself eating more healthy fruits and veggies. February 6th is right around the corner. In case you don’t know, that’s when the Super Bowl will be happening. While I don’t follow football very closely I do find myself curiously swept up in the party that accompanies this last game of the season. And I admit to wanting to watch the half-time show and the, usually, creative commercials. I find it curious that this is one day of the year when companies spend millions of dollars and put forth extra effort to make sure their commercials are smart, funny, creative, or interesting. It’s the only time I usually enjoy watching them. 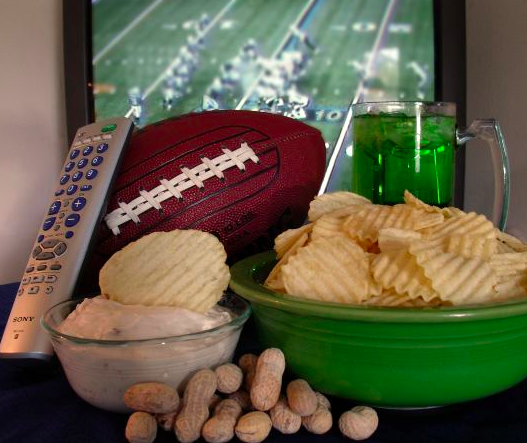 This day, Superbowl Sunday, is practically a holiday, with people making elaborate plans for parties and food. This is one of the few traditional gatherings where the menu doesn’t often include an entree or side dishes; it’s a smorgasbord of snacks. If you’re hosting or attending a Super Bowl Party you’re probably familiar with the traditional lineup of foods: loaded nachos smothered in queso, buffalo wings, cheesy spinach dip, chili, and sausage-laden pizza and more. Depending on the teams (and who you’re rooting for) the menu changes somewhat to accomodate the event. It’s like rooting for your favorites with food. Unfortunately many of those food choices won’t leave you in good shape. Instead of buying cheesy popcorn or sugary kettle corn consider making your own. Hot air popped popcorn with a modest amount of melted butter or coconut oil, salt and spices to taste is a crunchy delicious treat. Try chili powder, onion powder, or my personal favorite, ground up nori. Instead of caramel popcorn or people chow try making a healthy trail mix in your slow cooker. It’s extremely tasty, and with four different options to choose from you can make something for everyone. Add a fruit platter with a yogurt dip for a healthy, delicious treat. To make the yogurt dip take 1 cup plain organic yogurt and mix it with 1 heaping tablespoon of your favorite flavor of jam or with honey. Much less sugar than already sweetened yogurts and it’s your choice of flavors. Cut a selection of veggies into strips and rounds to use as dippers instead of chips and crackers. These go well with bean dips and even cheese spreads. You can also serve them with a tasty guacamole or a healthy homemade salsa. Less simple carbs, more veggies, that’s always a win. Instead of ordering giant super subs consider setting out an assortment of preservative free healthy lunch meats (Hormel Natural, Boar’s Head Natural, and Applegate are all good brands) and a selection of whole grain rolls, wraps, and sandwich thins. Let your guest make their own winning combination. Homemade meatballs served in a marinara sauce in the slow cooker make a great snack without all the grease and fuss of sausages or wings. If you’re going to serve pizza consider getting a thin whole wheat crust and topping it with lots of heart healthy veggies, light on the cheese. Avoid preservative-laden processed meats choosing grilled chicken breast instead (or add your own after delivery). Previously I had posted some delicious snack mix recipes for the crockpot. And in case you’re wondering, a crockpot and a slow cooker are the same thing. Crockpot is a brand name that has become a common usage term. They’re all slow cookers and in my opinion they’re one of the best kitchen devices you can own. I wanted to share another great use for your crockpot, seasoned nuts. At this time of year a lot of nuts are available in the grocery store fairly inexpensively. Making seasoned nuts is easy, tasty, and extremely versatile. Seasoned nuts even make great gifts when packaged in a cute jar with a bow or fabric top. I love nuts as a snack. They’re high in protein and are a healthy source of fat in the diet. Nuts also have lots of micronutrients (different ones for different nuts) adding to nutrient variety in the diet (in other words don’t always eat the same ones. It’s important to note that peanuts are not included here. First of all they’re not a nut, they’re a legume. Second, they’re not as healthy an option as true, raw nuts. Soaking the nuts will help break down the enzymes that protect them from germinating too early. Breaking down these enzymes will make the nutrients more available. How long you soak nuts depends on what type they are. You can use this soaking/sprouting chart that I found online as a reference. To soak nuts I prefer to add 1 T. of an acidic medium to the soaking water, usually liquid whey left over from making homemade Greek yogurt, but in a pinch lemon juice will do. You do need to dry the nuts after soaking before you make these recipes. You can either use a dehydrator or cook them on low (200 F) in your oven. When they are completely dry they are ready to eat as is or spice them up a bit. How you season them is up to you. I have a couple of mixes that I like but feel free to go ahead and make up your own. Energy bars are a great snack to have in your pantry. They are handy and healthy for after school, wonderful if you need a little something in the afternoon to tide you over until dinner, great for after a workout, and easily portable for on the road. Unfortunately many of the commercial bars are loaded with chemicals and preservatives (which should be avoided as much as possible). You can bypass the chemicals and preservatives in commercial energy bars if you make them yourself. My favorite way to do this is to start with a batch of my own Great Granola. It’s easy to make in your slow cooker, delicious, healthy, and very reasonably priced. The overall cost of these homemade energy bars is typically less than purchasing them in the store. To boost the nutrition of my energy bars I add sesame seeds, which are high in copper, manganese, calcium, magnesium, iron, and zinc. They also add fiber and a great nutty flavor. Another addition is almond butter. Almonds are an alkalizing nut with heart healthy monounsaturated fat. Studies have shown they can limit the rise in blood sugar which normally happens after you eat; they also provide antioxidants. Almond butter can be purchased in a number of grocery stores from the grind-your-own machine, you can make it very easily in a food processor, or you can purchase commercial varieties. If you purchase commercial almond butter look for one with no added oil, sugar, or preservatives. After making the bars I wrap them individually in wax paper and store them in an airtight container. They keep well although given their popularity I have yet to figure out exactly how long they will last. I recently made a batch of Christine’s Crockpot Granola. I really like making it as it’s very easy and it tastes great. While my overnight crockpot cereal is a huge hit you can only make enough for a couple of days. With the granola I can make enough for a week or more (depending on how fast we eat it). I posted the fact that I was making a batch of granola on FaceBook and got a comment from Sandy who didn’t know that you could make that in a crockpot. Well folks, yes you can. You can actually make a lot of things in a crockpot, one of the reasons I love mine so much. I own two. A small 2 quart and a larger 5 quart. I’ve considered getting a 6 quart but have no idea where I would store it in my rather small kitchen. First things first, let’s clear up the terminology. A crockpot is the same thing as a slow cooker. Crockpot is simply a brand name from the Rival Corporation. Slow cooker is what everyone else calls it because crockpot is trademarked. I call mine a crockpot because I happen to own a Rival brand and that’s what I’ve been calling it for 30 years. I got my first crockpot, which is my 5 quart when I was in college (and yes, I’m still using it all these years later, that sucker works like a charm). I went to a college where you needed to feed yourself on the weekends because the kitchen closed down. After a couple of weeks as a freshman I called my Mom and told her that I needed a hotpot and would she please buy me one. She asked me what I wanted it for. I said to make soup, sauces and things like that. I came home a few weeks later and there was a crockpot sitting on my bed. I was, needless to say, thrilled. She asked if that was what I wanted. I replied that I had been looking for a hotpot which cost about $6. She offered to return the crockpot and buy me a hotpot (better deal for her). I hugged the box to my chest and announced that I would definitely be able to use this. And indeed I did. For four years I was very popular on the weekend as several of us would pool our food and make soups or a huge pot of spaghetti sauce and eat together. It was great. After I got married I learned that a crockpot is a lifesaver when you have two working professionals. You come home and dinner is ready. It became one of our most used kitchen appliances. Then we started having kids and it became even more important to plan meals that would be simple, easy and fit into our increasingly busy schedule. Now we’re empty nesters but our crockpots still get used regularly and are one of my favorite time saving tools. Dry cooking in a crockpot can be tricky. That’s because the point of a crockpot is to seal in moisture. This reduces the amount of moisture you need to cook with and creates a slow braising effect. You need to adjust for dry/low moisture recipes; one trick is to leave a wooden spoon in the crock propping the lid open. You also need to make things that won’t burn or stick. Snack mixes are a good choice. You get a tasty, crunchy treat where you control the salt, sugar, fat and flavor content without all of the chemicals, preservatives and artificial colors of store bought snack mixes. Although I use cereals as the base for these mixes I tend to buy only cereals that do not have any objectionable ingredients. I also use raw or soaked nuts and add sea salt as needed for flavor. I prefer not to use roasted nuts because they are not as healthy for you.